We took our dogs to Pet Fest today - and got lots of freebies! 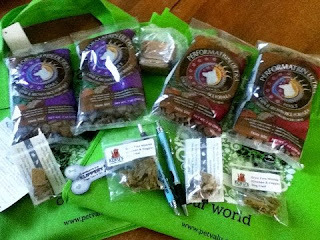 We got 2 cloth bags, 4 trial bags of dog food, 5 sample bags of dog treats, 2 pens & 2 magnets - one with info on poisons to watch out for dogs. The dogs got to try out the agility training ring, and get their nails clipped for $5! It was very hot here today - I felt like I was melting! Exhibitors had sun shades over their booths and I was going from booth to booth, just to stand in their shade today. All the booths had water bowls out for the dogs - which was nice!